Whether you know it as “The Barn”, “The Shed”, or even “The Temple of Tire”, generations have come to know the little building just on the east side of the tracks as a place to get specialized service to ensure a smooth and safe ride. 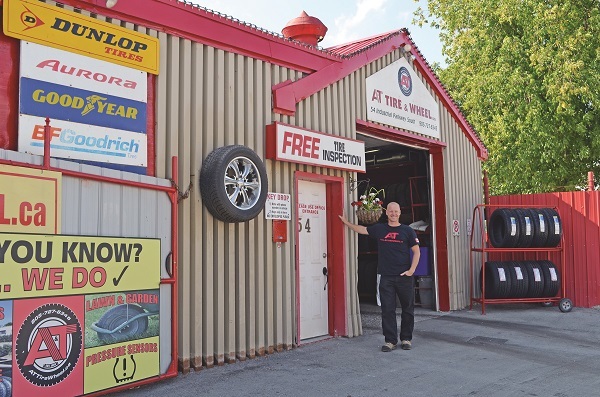 Now, A&T Tire & Wheel is marking 50 years of service in Aurora with a community celebration this Saturday from 12 noon to 4 p.m.
A&T Tire & Wheel might now list Industrial Parkway South as its address, but when the “barn” was first raised on the same location, it was Ross Street. Industrial Parkway was little more than an idea at that point. The business was founded by Anne and Tony Tielemans on the opposite site of the street, very much a family business. The Tielemans owned the business until 1998 when it was bought by Dan. And the business keeps evolving. From the early days of dirt floors, the A&T is now a shiny red showplace, always busy, and always a showcase for memorabilia charting automotive history. They are small by design. They want to maintain that small-town, personal feel in a market that is continually bringing in competition from big box stores. They see that competition as a bonus because it affords them the opportunity to highlight their very specialized services and attention to detail. “I have been in tires for 26 years and everyone we hire is knowledgeable about the details. If someone has a classic car or a custom wheel package they want to put on, generally the big box stores won’t be able to help very well with that. They might dabble, but they don’t specialize in that. We want to give excellent customer service. Their location has proven adjacent to the GO Station has proven advantageous over the years as well, with many customers leaving their cars at A&T before heading out for their morning commute, leaving a note with what they need done, such as a tire change, and coming back at the end of the work day to drive home. But the location might also prove to be a challenge as Metrolinx, the operator of GO Transit, is looking to expand rail service in the area, including double tracking. Land on the west side of the tracks has already been purchased to allow that to happen, and Mr. Young says overtures have been made to A&T as well, but they have no intentions of budging from their home for over a half-century. A&T Tire & Wheel marks its 50th anniversary this Saturday, September 15 with a community celebration starting at 12 noon with a free barbecue which will accept donations benefiting Abuse Hurts. A free jumping castle and balloons for the kids runs all day with a live band, Smokey Monaghan, performing at 2 p.m., and door prizes at 4 p.m. A&T is located at 54 Industrial Parkway South.